Dr Terrell: "Women 40+ Need Yoga!" 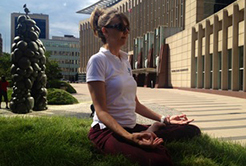 This post is brought to you by our own Yoga HotDisher, Top Doc, and now, Minnesota Monthly CoverGirl, Dr. Carrie Ann Terrell, MD, University of Minnesota (UMN). Thanks Carrie for contributing to our blog! After 14 years of practicing yoga I can honestly say it makes me a better person. I build better relationships. I think more clearly. I know my limitations and know what I need to care for my self. I can separate myself from my wrongdoings, my suffering, my awards, my rewards, my family and my thoughts. With this ability I am able to set my work and personal goals in alignment with my deepest beliefs. I am able to achieve lifelong goals and hold positions of leadership with a sense of love and responsibility. I get to choose how I will react to incoming stimuli (if at all) and I can readily access a place of peace and serenity within myself.